Chef Jim Gerhardt brings over 30 years of award-winning experience in fine dining to the Pendennis Club. A graduate of the Culinary Institute of America, his professional journey began at Cincinnati’s Maisonette restaurant and continued at The Mansion on Turtle Creek, the Four Seasons Hotel, Wyndham Hotel, and on to the Stouffer Grand Beach Resort on St. Thomas U.S. Virgin Islands. From there he moved to The Oakroom at Louisville’s Seelbach Hotel, Where he transformed dining at the historic hotel, won numerous awards including Kentucky’s first and only AAA Five Diamond Award. He is recognized internationally as one of Louisville’s finest chefs. Chef Gerhardt was honored to be included in the James Beard Foundation’s “Great Hotel Chefs of America”. The Oakroom was also been honored by the Beard Foundation as one of the nation’s “50 Best Hotel Restaurants”. Chef Gerhardt was invited to be guest chef at The Great Chefs Dinner sponsored by The Family Tree, in Baltimore, joining the ranks of luminaries such as Georges Perrier, Jean-Louis Palladin, andLarry Forgione. He also was invited as guest chef for Holland America Cruise Lines as one of the hosts along with best-selling author Sue Grafton. A member of the Chaine des Rotisseurs, Gerhardt has served as a spokesperson for the National Pork Producers Council and American Dairy Management Council. His extensive television experience includes work on the Food Network, Travel Channel, History Channel, local CBS, NBC, and ABC affiliates and “Secrets of Louisville Chefs”. 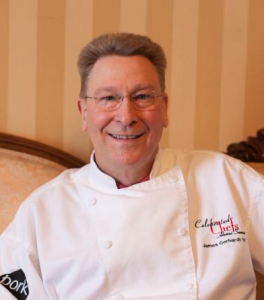 Chef Gerhardt has been featured in Southern Living, Food and Wine, The Wine Spectator, Whisky Magazine, Saveur, and Conde Nast’s Travel magazine as well as The Courier-Journal and numerous Louisville and regional publications.